The lines above are arguably one of the most recognised sci-fi title sequences in the world. The original Star Trek series debuted in 1966 immediately turned into a cult classic, and has had a major influence in sci-fi filmmaking ever since. The latest (and boldest) reboot of the iconic title by JJ Abrams, Star Trek (2009) and Star Trek Into Darkness (2013), have managed to reignite the decades of fandom, as well as capture new and wider audiences. From the beginning, the original Star Trek series has created a phenomenon for legions of Trekkies due to its futuristic nature. The late Gene Roddenberry, creator of the original series, is highly credited for the series’ major influence on the world of science fiction. In fact, several advanced technologies in Star Trek have served as inspiration for current inventions – mobile phones, handheld scanners among others. Decades have passed but the impact is still strong with scientists still figuring out ways to make Star Trek technology a reality. A quick disclaimer – this piece covers only the recent reincarnations of the Star Trekfranchise. Before devoted Trekkies begin to argue the appeal of the latest installations (Kirk vs Picard among others), the focus is purely on the takeaways from the movies, for both personal and professional intent. Now that the course is set, let’s look at the five main leadership lessons from Star Trek. In the beginning, Kirk is mostly a solo act, a rebel never reliant of others. His own style of bulldozing through challenges (and cheating on a test) more often gets him into trouble. Aside from his trusted confidant, medical officer “Bones” McCoy, Kirk does things his own way – even when he takes over the captain’s seat on starship Enterprise. Very soon though, as the Enterprise runs into battles (fighting the advanced Romulan enemy), Kirk has to depend on his team of experts. He knows that he has to listen to what everyone has to say, no matter whether they are poles apart to his leadership style. Kirk is inherently a serial rule breaker; Spock on the other hand is a walking rule book devoid of emotions. Among Kirk’s circle, McCoy appears to be always in some sort of urgency and short-tempered; Scotty a wild mannered, yet very principled and outspoken genius engineer. An odd mix of characters, but they gel really well and watch after each other. They are stronger together than apart – they make up for each other’s weaknesses, and pull each other towards the centre. Every one of his crew brings not only variety, but also a different point of view which is valuable in decision making. A good leader always needs a team of excellent counsel. Hiring knowledgeable people is critical, but it is also important to hire a diverse set of people. Kirk appears to have a very important aspect of a great leader – always welcoming others’ constructive opinions. Valuing others, and allowing a sense of ownership to team members are fundamental to assembling a great team, and Kirk does that masterfully. Small wonder that the crew manages to outsmart their enemy and find their way out of trouble, saving the lives of many along the way. 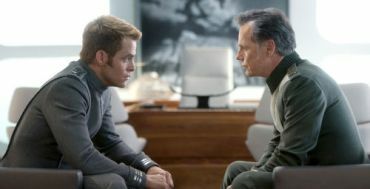 Another important characteristic of Kirk is that, while he delegates when he knows his crew members are more capable, he takes full responsibility for their actions. He may not lead every single mission, but he is actively involved and gets his hands dirty most of the time. Kirk knows that as a leader, he holds the ultimate responsibility of making sure all his crew members are safe. In the movies, the crew of USS Enterprise is always outgunned by their adversaries. From the Romulans to John Harrison/Khan, more often than not the enemies have bigger battleships equipped with more ammunitions than the Enterprise can handle. Surprisingly, Kirk and crew still manage to overpower their opponents through sheer tactical brilliance. Kirk and Spock normally would take some time to understand their enemies before confronting them head-on. For one thing, the Enterprise is primarily an exploration vessel, not adequately equipped for combat (phasers are mostly defensive measures). And while Kirk is perfectly fine with hands on melee, his brainstorming with Spock usually provides a breakthrough of winning blows. While Kirk will not hesitate to just jump into action, he would also attempt to study all about his opponent. In this aspect, Spock makes a valuable ally, as his analytical and data-driven nature often proves very critical – be it defeating Romulan threats or outsmarting Khan. More interestingly, their battles are won after capitalising on the enemy’s weaknesses more than the Enterprise’s own strength (not a warship). Similarly, in a competitive environment, it’s wise to take note of what others are not looking at. Successful entrepreneurs have long been lauded for observing others and going against the tide. In fact, among the world’s super affluent, Warren Buffett attributed his wealth to his extremely comprehensive groundwork. The Sage of Omaha always does his thorough research before parting his money into investments (and it almost always makes positive returns). If their methods are tested and proven time and again, surely there’s a wisdom to the advice. Analyse, but don’t over-analyse – or as they say, analysis paralysis. Of course, doing your homework alone will not necessarily get you to where you want to be; there are other variables that could potentially affect the outcome. And when that happens, follow the next advice: improvise. In Star Trek Into Darkness, the opening scene shows Kirk and McCoy running away from an alien race after stealing a sacred scroll. Kirk’s real intention for his actions is to distract and save them from impending danger after a massive volcano eruption, threatening their entire civilisation. Spock is then tasked to neutralise the volcano right at the heart of the explosion. With very limited time to escape and service shuttle unable to get close to Spock, Kirk is pressured to save Spock before he is caught in the middle of the blast. Acting on his intuition, Kirk brings Enterprise close to the volcano and beams Spock up just in time to save him. Had he not done that, Spock would have died, but in doing so Kirk violates the Federation’s Primary Directive. Still, Kirk had to improvise to save Spock. In a later scene, Enterprise is stranded in space after being intercepted and attacked by a Federation battle cruiser. Severely damaged, and still under real threat, Kirk has to act fast to ensure Enterprise is safe from total destruction. But they have one big challenge (aside from not having firepower) – they have to take control of the enemy ship without being detected. No teleportation. Their solution? Kirk and Harrison go on a space jump to get to the other ship. An extremely dangerous approach due to a massive field of debris from the battle. Midway through, Kirk’s visor cracks, compromising his navigation assist and putting him in real danger. Kirk is helped back on track after Harrison guides him using his bearings. In our daily lives or at work, sometimes our plans do not necessarily go smoothly. There will always be obstacles along the way. What is important is how we respond to the situation – intuition and improvisation can work wonders. Kirk had to take the Kobayashi Maru (no-win situation) test to progress from a normal cadet. His solution? Change the programming logic. While that particular act is not legitimate, that very tendency saves Kirk from great danger during his space travels. Just a caution, while improvisation and intuition might work in your favour, you might need to have some sort of guidance before making that leap of faith – actions still have consequences. It is best to learn from those who have gone through it before and share great wisdom with you. And for that, you might want to search for suitable mentors. 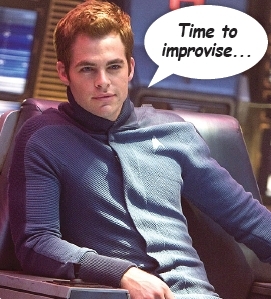 Before life with Starfleet, young Kirk was always getting himself into trouble, not really knowing his purpose and quite simply being a lost soul. Captain Pike discovers him and encourages him to enlist in honour of his father’s memory (Kirk senior sacrificed himself to save many lives). After rising up through the ranks (in his usual swashbuckling style), Kirk goes all the way to rescue his captain under the captivity of the Romulan. Upon his promotion to captainship, Kirk takes command of Starship Enterprise and continues to report to Admiral Spike. In Star Trek Into Darkness, Kirk violates the Primary Directive (never to interfere with other civilisation development). He finds himself demoted, leaving the command of Enterprise back to Admiral Pike. The event leaves him devastated, but Pike puts in a request to keep Kirk on the Enterprise as first officer. Pike plays an important figure in Kirk’s life, imparting sound advice when he needs it, especially in realising the need to have humility and not to put his crews’ lives in unnecessary danger. Even in real life, a good leader would and should have a mentor to guide him/her. Simultaneously, a good leader should also aspire to become a good mentor to others. The Enterprise cannot operate efficiently without the help of a well-oiled team. The voyages under Kirk rely heavily on its crew. Although the starship is effectively run under a military hierarchy, Kirk often plays the role of a mentor to his crew instead of an autocrat. He guides them towards a unified objective, even if he has to put his life in danger to save them. A good leader-mentor has to realise the importance of putting the team above everything else. You have to put your people first before yourself. It is highly important that a good leader helps and guides the rest of the team to succeed. Additionally, you cannot let your chain of command keep you from getting the best advice, just like how Kirk always relies on his crew for important information or advice. Of course to play the role of a good leader-mentor, you do not ask your people to do what you wouldn’t do yourself. Kirk may be willing to put himself in harm’s way, but he wouldn’t ask his crew to take on risks he himself wouldn’t face. At the very core of it, Enterprise’s ultimate mission is to explore new civilisations and alien worlds. Its journeys are not without danger and often full of unforeseen surprises, both good and bad. When facing the dangerous Romulan from an alternate universe in the future, Kirk and crew had to respond fast even though they are not prepared. Still, they manage to overpower and defeat the threat. 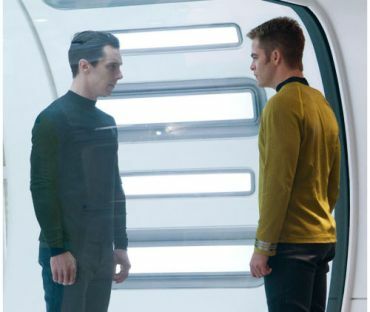 In the next movie, Star Trek Into Darkness, Kirk takes the Enterprise on an unofficial mission to Kronos to locate and bring back Harrison after a crime he committed. The planet is out of bounds for the Federation as it is home to their archenemy, the Klingons. The mission must be undercover so as to not start a war with the alien race. Kirk takes with him a small landing crew, encounters a group of Klingons and transports Harrison back to bring him to justice. Kirk and his crew have to leave earth, embracing any forthcoming challenge as they explore new worlds. Along the way, they learn a great deal about themselves, realising each of their own strengths and fears. And with each new adventure, they boldly go where no one has gone before. Back on earth – and real life – we can replicate a similar tenacity that Kirk and his crew embody. Leaving our own comfort zone is scary, but the rewards are limitless. Even without leaving our offices, we can open our minds to endless ideas and possibilities. Dream big and you will most definitely be a game changer yourself. Maybe that new idea can propel your organisation to a new level, or a new process flow to revolutionise the whole industry. Every new idea has value and potential to go really big – just like electric cars and space travel! Our fear of failure might have been the biggest stumbling block, but that is besides the point. What really matters is that you reach for the stars and believe that you can get there. If there is a will, there will always be a way. In retrospect, Kirk has the best mix of crew to be by his side during all his journeys. The diversity surrounding Kirk gives him a great advantage when dealing with various situations. He has built a great team representing a host of skills instrumental to exploring the universe. Ultimately, Kirk shows his capacity as a great leader. His character might be fictional, but the leadership qualities are real – something that we all can aspire to and emulate. Next article Brain Hack: Do Rewards Really Work? Top 10 Ways To Increase Your "Luck"